Congratulations to Alex, the winner of last week’s Math Minute! Enjoy your Adopt-a-Microbe t-shirt! One more week left to win that t-shirt. Pass it on to your classes, your kids, your friends. You can show off your cool new t-shirt when you win! Monday: The density of steel is almost 8 times the density of seawater. The seawater still provides a bit of buoyancy, and our steel drill string doesn’t weigh as much in seawater as it does in air. This weight is related to the ratio between the density of steel vs. seawater, and is approximately 7/8 of the weight in air. If our drill string weighs approximately 413,280 pounds in air, how much does it weigh in water? Our drill string weighs approximately 361,620 pounds in seawater. Tueday: We finished coring hole U1383C today! Altogether, we retrieved 50.31 meters of core, which was a 19.2% recovery. If we began coring at 69.5 mbsf (meters below sea floor), what is the final depth of the hole? The final depth of the hole is 331.5 meters below seafloor. Wednesday: We have an atmospheric microbiologist onboard who is studying the microbes that travel on dust particles in the wind from Africa across the Atlantic to North America. We are approximately 3000 km away from the coast of Africa. 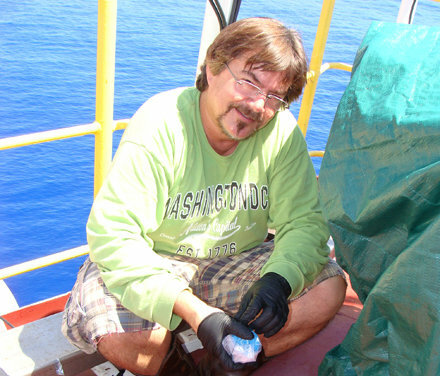 If the average wind speed is about 14 knots/hour, how long have the microbes been travelling before he collects them here on the ship? The microbes have been travelling for 115.83 hours, or 4 days, 19 hours and 50 minutes before he collects them. Thursday: We now have about 4700 meters of drill string hanging from the ship, which weighs about 540,000 pounds. A typical blue whale weighs about 108,000 kg. How many blue whales would weigh the same as our drill string assembly? Our drill string weighs approximately as much as 2.27 blue whales. Friday: After we collect all of the core from a hole, we send logging instruments down into the empty borehole to take measurements. These tools are raised and lowered at different speeds. To and from the seafloor (4500m), they run at 6500 ft/hr. On the way down through the hole, they are lowered at 1500 ft/hr while they take measurements. On the way up, they take even more measurements, so they are raised at 900 ft/hr. If the hole is 330 meters deep, how long does it take to complete the logging run? It should take about 6.46 hours, or 6 hours, 28 minutes, to complete the logging run.